Renowned racetrack and host of the Kentucky Derby, Churchill Downs, has tapped mobile enterprise communication company Lua to power the 141st annual Kentucky Derby on Friday, May 1st and Saturday, May 2nd. 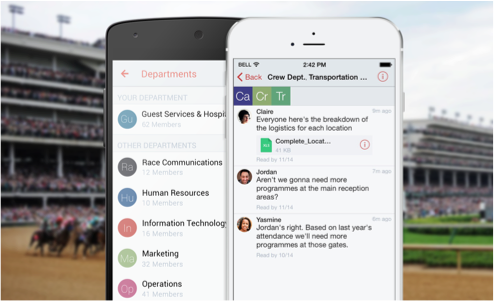 In using Lua, Churchill Downs has ensured that all patrons enjoy the greatest two minutes in sports by addressing one of its biggest operational challenges - handling internal communications amidst a crowd of 165,000. Lua works with the Barclays Center, the US Military, top music and food festivals, events, and hospitality venues, and powered communications for Super Bowl XLVIII. Lua’s enterprise messaging solution easily connects everyone within an organization from the corporate office to every member of a staff. Instead of relying on dated technology, such as walkie-talkies, or depending on emails or personal texting to communicate, Lua allows a team to send secure real-time messages with attachments, as well set up group calls in three easy taps. Lua, which can easily be used “out of the box,” keeps everyone accountable by showing users who has read each message and opened each attachment. The strength of all the above features has led to an average message read rate of 98% across all Lua clients, a significant improvement over email, which has a 20-60% read rate. "We're thrilled that the Kentucky Derby, one of the most historic sporting fixtures in the US and a world-renown event, has chosen Lua for its mobile communication needs,” says Michael DeFranco, CEO and founder of Lua. “Year after year, the Derby has demonstrated its commitment towards improving the race-day experience for its guests. This year, we look forward to helping the Derby run its smoothest event yet." Lua is so secure that it is the first mobile enterprise communications company to be approved by the US Government to work with all its agencies. As the Derby makes changes to security and ticketing this year, Lua will be an invaluable resource to handle any issues that arise to be diffused in real time and ensure things run smoothly. Potential issues a large venue such as Churchill Downs can face include the need for evacuation and first responders on the scene, as happened in the days prior to Superbowl XLVIII when an anthrax scare occurred. By keeping every staff member connected through Lua, communication happens in real time and emergencies are handled with calm and finesse, looping in any necessary outside organizations. Churchill Downs, the world’s most legendary racetrack, has conducted Thoroughbred racing and presented America’s greatest race, the Kentucky Derby, continuously since 1875. Located in Louisville, the flagship racetrack of Churchill Downs Incorporated, which offers year-round simulcast wagering at the historic track. Churchill Downs will conduct the 141st running of the Kentucky Derby Presented by Yum! Brands on May 2, 2015. The track has hosted the Breeders’ Cup World Championships a record eight times. Information about Churchill Downs can be found at http://www.ChurchillDowns.com.